This breed, which is raised in the district of Germany from which it takes its name, may be regarded as, upon the whole, the most valuable of all the Continental varieties of heavy carriage horse. At all events many - far too many - scores of Oldenburghs are to be seen in the Park every London season, as British dealers, despairing to find the stamp of horse that is required for landau work in the home market, are compelled to patronize the foreigners. Without, however, laying one's self open to the reproach of being narrow-minded and insular in one's views, the opinion may be expressed that, showy and imposing as the Oldenburghs are, they do not possess the bottom and the stamina of Hackneys, Cleveland Bays, or Yorkshire Coachers. On the other hand, they fill the eye as extremely fine-looking barouche or landau animals, for though, as a rule, they may not possess the finish about the head of the Yorkshire Coacher or the Hackney, or the quarters of any of the British Harness breeds, they carry themselves for the most part very boldly, have fine middles and plenty of bone, and are almost invariably very good indeed in colour, a gray or a chestnut being a rarity amongst them. By Prince George 367 V. C. S. B., dam by Barnaby 670 V. C. S. B. Beyond all doubt the Oldenburgh is an ancient variety of horse, indeed it is claimed for the breed that it has been in existence for over three hundred years, and no doubt the tap-root from which the modern Oldenburgh has descended must have been alive somewhere and in some form at an earlier date. This admission does not, however, go the length of suggesting that no foreign blood has been introduced into the old strain whatever it may have been; and the appearance of the Oldenburghs very strongly suggests the presence of Hackney and Coacher blood. 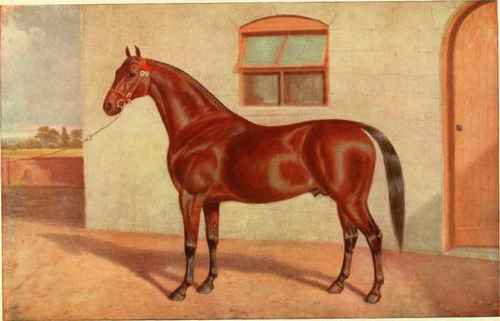 From the former, beyond all doubt, the fine action which is characteristic of the German horse has been derived, and it is extremely probable that the Coacher gave him size and quality, the latter through the thoroughbred blood the Yorkshire possesses, and very likely colour as well. Whilst upon the subject of colour, it must be admitted with feelings akin to shame, that Continental horse-breeders are far in advance of the Englishman in this respect. They have from the first realized the fact that bays and browns are the colours most in request amongst those who use big horses, and chestnut the least popular of all; and it is mainly to the fact that our foreign rivals can supply the public with what the latter want, that British horse-dealers can find in Germany and elsewhere the class of animal which is so very scarce at home. In addition to size and colour the breeders of the Continent have aimed at the production of action and style, and these they certainly have secured; as for his height and weight, the Oldenburgh possesses both these characteristics, the latter to a marked degree. Opinions differ as to whether the constitution of this horse is robust or not, his foreign breeders averring that it is; but people who have experience of him in this country are by no means unanimous on the point. Moreover, it may be repeated that, though there are exceptions, the Oldenburgh, horse for horse, does not possess the endurance of the British breeds from which he is descended; but for park work he is well adapted, and hence his frequent appearance in the equipages of the highest in the land.